And I want to say something to the schoolchildren of America who were watching the live coverage of the shuttle's take-off. I know it's hard to understand, but sometimes painful things like this happen. It's all part of the process of exploration and discovery. Twenty three years ago today at about 10am, I was a six year old school boy, watching a television screen with two dozen other kids in a suburban school outside of Houston. On the TV screen, a rocket-powered space shuttle pushed itself towards space. It almost poetically rolled as it ascended. Then, it exploded. I watched as white smoking pieces of debris fell and fell and fell from five miles above the earth. I watched as the rocket boosters spun away in a mad, spinning panic. Even as a first grader, I knew something had gone terribly wrong. Just weeks before the explosion, I recall visiting a space museum and actually seeing moonrocks. The idea of traveling through space was fascinating. The stars seemed closer. But, it all was so surreal at the same time. The stars weren't closer and the moon was a million miles away. How could this paradox be? on the weekdays. Holidays were negotiable. There was fighting and yelling. Sometimes I wondered if the Moon was such a bad place to live. 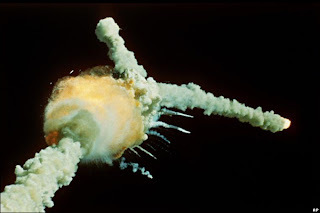 Watching what remained of Challenger get reclaimed by the force of gravity, I realized that the Moon was too far away. I experienced my first taste of cynicism. I knew that the tragic was the real. A year later, my mother passed away. Even as a second grader, I knew something had gone terribly wrong. The Moon was too far away, and outer space was something beyond my reach. All kids have wild hopes and dreams, but at that time, it seemed like mine were descending in a million burning pieces back to the ground. When did you have your first experience with "gravity?" When did life reclaim your stratospheric hopes or dreams? What was that like? Have you changed since then? I didn't have a perfect childhood, but then, who does? For some reason though, it took me until I was in my 20's and married before I was able to look back at my past and see it with clarity. I feel like I had lived in a cacoon most of my life, accepting and doing what people told me. At some point in my early twenties, as I began to experience life outside of my family and the world as I'd always known it, a hole was punched in my cacoon. So, as I thought about the question and tried to come up with a time in my life when I came to understand the world for what it is, I realized that it took me far longer than most people. The really hard part is coming to this realization and not letting it make you bitter and unable to see the good in life! I was left out of a missions trip when I was in junior high. I think that's when I stopped believing a group of people could ever want me.